Sri Lanka Muslim Congress (SLMC) Leader and Justice Minister Rauff Hakeem said yesterday he had discussed the Dambulla Mosque dispute with President Mahinda Rajapaksa and that he was confident it would be resolved with justice to all. As the dispute over the mosque in Dambulla continues for the second week amid local and international media focus, a solution to it may come in the coming days with the intervention of President Mahinda Rajapaksa. The President returned to the country on Friday after a five-day official visit to South Korea. During his stay in South Korea, Prime Minister D. M. Jayaratne tried to solve the dispute. But his attempts created a fresh controversy with Minister A. H. M. Fowzie and Western Province Governor Alavi Moulana denying his claim that they took part in a meeting where a decision was taken to shift the mosque to another place. Past week has been a historic one for Sri Lanka Muslims due to the unpleasant Dambulla mosque incident occurred on 20th April 2012. Sri Lankan Muslims not only in Sri Lanka but all over the world were focussing on the post attack development around the country. While some associations organised protests to show their anger and refusal of government's decision to remove the Masiid, All Ceylon Jamiyyathul Ulema (ACJU) releasing an a statement last week requested Muslims to avoid protests and not to distrub the law and order of the country. The statement also recommended Muslims to engage in supplications, observe fast and make Dua seeking Allah's (swt) assistance for a peaceful settlement to the matter. In this backdrop, yesterday's Jummah sermons in most of the Masjids in Sri Lanka were around this subject. These sermons were addressed in several angles to the issue however all of them with particular emphasis on how Muslims should take up such difficult times and how Qu'ran and Hadeeths guide us in this respect. Special Duas were also recited in some mosques. In an important statement issued to the public by All Ceylon Jammiyyathul Ulma (ACJU) on the prevailing situation in country after the Dambulla Mosque incident, they appeal to all Muslims of Sri Lanka to maintain peace and calm without disupting law and order by holding improper demonstrations causing inconvenience to public and damaing public property. ACJU reminds Muslims of Sri Lanka that they should not forget the fact that the majority of the Buddhist poepl are peace loving, rational and fair minded; and they do not approve such acts. ACJU futher reiterates that according to Islam the best weapon for Muslims in such situations is Supplication, thus request Muslims to pray and observe fast and make Dua to seek His assistance. Muslims of this country are deeply worried over the recent incident took place in Dambulla in which a gang stormed the Jumma Mosque of Dambulla and damaged the place on 20 April, Friday. Muslims along with peace loving citizens of Sri Lanka are fretful if this incident would negatively impact the reconciliation that has started to sprout among communities since recently. அகில இலங்கை ஜம்இய்யத்துல் உலமா விடுக்கும் முக்கிய வேண்டுகோள்! கடந்த வாரம் தம்புள்ளையில் நடந்து முடிந்த பள்ளிவாசல் தாக்குதலையடுத்து நாடெங்கிலுமுள்ள முஸ்லிம்கள் மிகுந்த கவலையிலும் இதுவரை காலமாக நிலவி வருகின்ற சமூக ஒற்றுமை சீர்குழைந்து விடுமோ என்ற அச்சத்திலும் இருந்து வருகின்றனர். சிலர் மேற்படி விடயத்தை கண்டிக்கவும் எதிர்ப்பு நடவடிக்கைகள் மேற்கொள்ள வேண்டுமென்று தூண்டிக்கொண்டும் இருக்கின்றனர். இந்நிலையில் இஸ்லாம் காட்டிய வழிமுறையொன்று இருக்கிறது என்பதை அகில இலங்கை ஜம்இய்யத்துல் உலமா நினைவூட்ட விரும்புகிறது. විසින් නිකුත් කරනු ලබන වැදගත් නිවේදනයයි. ඉතා කනගාටුවට පත්වී සිටින අතර මෙතෙක් කල් පැවැති සමාජයීය සහජීවනය බිද වැටෙදෝ යන සැකයකින්ද පසුවෙති. A joint press release signed by Ash-Sheikh M.M.A Mubarak, General Secretary, All Ceylon Jamiyyathul Ulama and N. M. Ameen, President, Muslim Council of Sri Lanka strongly notes their deep concern over the misleading statment made by Deputy Minister Hon. M. L. A. M Hisbullah when he met with Rev. Inamaluwa Thero yesterday, 23rd April 2012. The order comes two days after Buddhist monks led a crowd trying to storm the mosque in the central town of Dambulla. 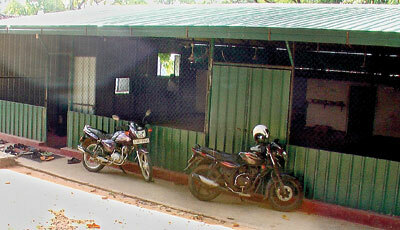 Prime Minister DM Jayaratne says the mosque has simply been ordered to relocate to another part of the area. தம்புள்ளையிலுள்ள சர்ச்சைக்குரிய பள்ளிவாசலை அகற்றுமாறு புத்தசாசன மற்றும் சமய விவகார அமைச்சரும் பிரதமருமான டி.எம்.ஜயரட்ன இன்று ஞாயிற்றுக்கிழமை உத்தரவிட்டுள்ளார். A tense situation has erupted in Dambulla following clashes over the issue of a temple and a mosque. According to sources in the area, angry mobs have now surrounded the mosque where at least 50 Muslim devotees have gathered for the congregational Juammah Prayers today. Parliamentarian A.H.M. Azwer issuing a condolence message on the death of SLBC Marketing Unit Director Nooraniya Fouzul Hassen said, 'It is with a deep sense of sorrow I condole the sudden demise of SLBC Marketing Unit Director Nooraniya Fouzul Hassen. 'He met with a fatal accident at Rambawa yesterday morning while travelling to Jaffna with his colleagues on an official assignment. 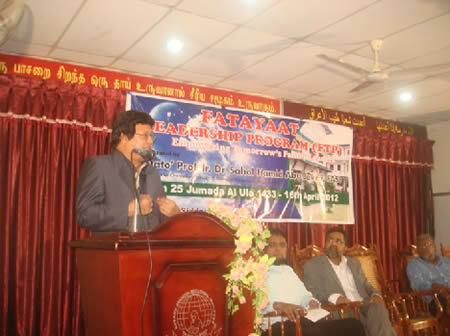 Fatayaat Leadership Program(FLP) with the slogan, ‘Empowering Tomorrow’s Family Leaders’ commenced on the 16th April 2012 and is in full swing at Ayesha Siddeeqa Educational Institute (ASEI). Forty eight ladies in the age range of 18-25 are actively participating. Prof. Dato’ Sahol Hamid, President / Vice Chancellor, University Teknologi MARA, & Assistant Police Commissioner of Malaysia, who graced the occasion as Chief Guest, delivered the keynote address on ‘My Mother’. He related his life story, on how as the first child of a downtrodden family, his mother painstakingly helped him to rise to the position he is now in. The story contained full of inspirations and emotionally touched the hearts of the listeners. 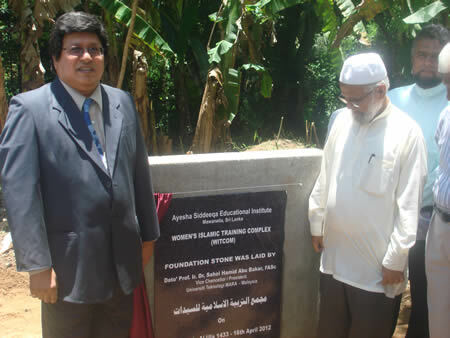 Dato' Prof. Sahol Hamid, FASc, President, Universiti Teknologi MARA, Malaysia and Assistant Police Commissioner of Malaysia laid the foundation for the construction of WITCOM - Women's Islamic Training Complex at Ayesha Siddeeqa Educational Institute (ASEI), Mawanella, Sri Lanka. WITCOM is concept designed eco-friendly Islamic training facility exclusively for women. The facilities available in this three storied building include Main Lobby, Library, Lodging for 70 participants, Gymnasium, Lecture Theater, Media Centre, Swimming Pool, First Aid & Sick Room, Home Science and Sewing laboratory, class rooms, Dining, Servery and Kitchen etc., The project was developed by Br. Riza Yehiya, built environment & sustainability consultant.